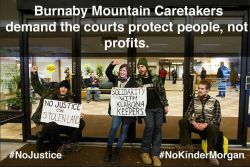 VANCOUVER — Early this morning four Burnaby Mountain Caretakers have locked themselves to the Supreme Court entrance in Vancouver. The action was taken to draw attention to the role of the courts in ongoing colonial occupation of Indigenous territory on Burnaby Mountain and across the country. These decisions by the BC Supreme Court continually dispossess indigenous people of the territories they have occupied and governed for thousands of years. Squamish elder Sut-lut was arrested last Thursday while protecting a traditional totem pole. This morning, Tsleil-Waututh elder Ta'ah George will be arrested, alongside Union of British Columbia Indian Chiefs Grand Chief Stewart Phillip, after crossing police lines set by the BC Supreme Court. "We've been here for thousands of years, and we'll be here for many thousands more," George said this morning. "We've been stewards of the land, and when we're stewards of the land, we make choices for our future generations. That's for my children and my grandchildren and yours too." 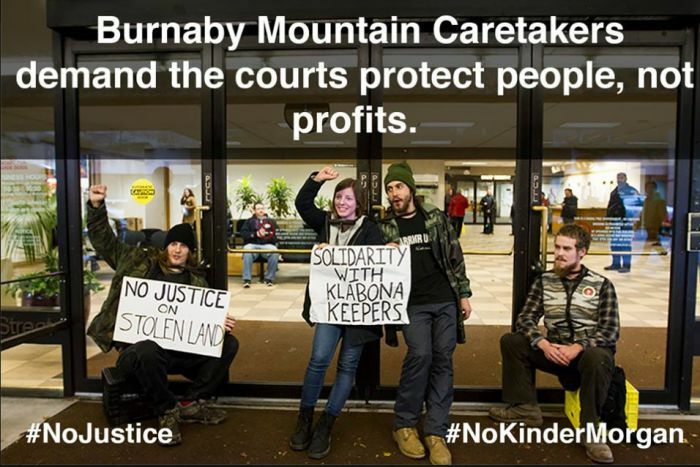 Yesterday, the BC Supreme Court in Terrace granted Imperial Metals — the company responsible for the Mount Polley Mine disaster — a long-term interlocutory injunction and enforcement order, displacing the Klabona Keepers, guardians of the Sacred Headwaters, from their traditional territory. Yet another case in which corporate profits were deemed more important than indigenous land rights.